With CookDiary you can now share your recipes with friends and family on Facebook. Just select a recipe in CookDiary and click “Share” and your recipe will be pinned on your Facebook wall. Cookdiary is now active on Facebook as well. We will keep you up to date, present new features of CookDiary and would be delighted to receive your feedback. Thanks a lot for supporting us. Recommend CookDiary to friends and family and help us improving your personal cooking program. We improved the support for various types of printers in this version. Facebook changed its interface for developers. 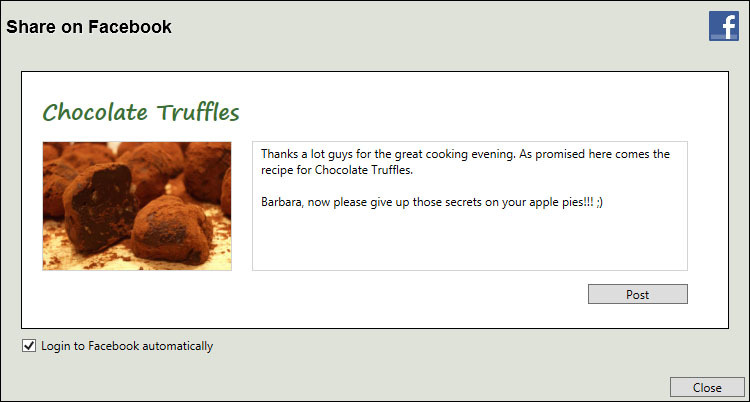 We had to make some changes to allow sharing of recipes again. This update fixes a bug which could prevent CookDiary from launching. This update improves stability and fixes some problems that could occur by using multiple monitors. Start your registered version which will notify you about the update.